Fort Valley, GA, March 23, 2019 --(PR.com)-- A 17-year-old boy named Zac living in Fort Valley, Georgia, has just received an extremely special Seizure Response Service Dog from Service Dogs by Warren Retrievers. 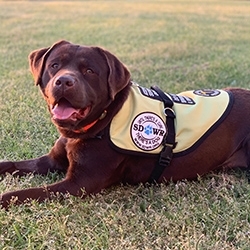 Service Dogs by Warren Retrievers, or “SDWR,” has a mission to provide specially bred and custom-trained dogs for individuals of all ages with invisible disabilities like Autism Spectrum Disorder, PTSD, Diabetes, or in the case of Zac - Seizure Disorder. In addition to hundreds of working dogs already placed, there are over 400 families enrolled in SDWR’s program awaiting their service dog delivery. Zac was diagnosed with epilepsy at the age of 6 years old. Zac's epilepsy severely limits his independence and he cannot drive or go anywhere by himself. It also causes him emotional distress by worrying about having a seizure. Because Zac is epileptic he experiences multiple seizures a month. The frequency varies between several per week to month. Zac has tonic-clonic seizures which cause him to lose consciousness and control of his body movements. He will fall if standing or fall out of chairs, beds, etc. if on them when having a seizure. Afterward, he is usually very tired and sleeps a lot. With Alva by his side, Zac is confident that having a Seizure Response Dog will provide him with the independence he needs to face the everyday challenges of living with epilepsy. Alva is also an honored graduate of the SDWR Fallen Officer Puppy Program. The Fallen Officer Puppy Program, also known as “FOPP,” is an initiative by SDWR to pay respect to the legacy of service by fallen American police who sacrificed their lives in the line of duty. Eugene is named in honor of fallen hero Deputy Sheriff Edward Joseph Alva of the Richland County Sheriff's Department in South Carolina who was accidentally shot and killed by his partner while struggling with a mentally ill man during a domestic disturbance call. Alva’s work as a Seizure Response Service Dog with Zac will carry on in memoriam of Deputy Alva’s life of service before self. With the new arrival of Alva, Zac will have a four-legged tool that has received foundational training to not only assist Zac during seizures, but also help him to live a more independent and less anxiety-filled life. Thanks to the Americans with Disabilities Act (ADA), Zac’s service dog will be able to accompany him everywhere -- from hunting and fishing, to running errands, and even to school. SDWR will continue to work with Zac and Alva in his home environment, to train for specific needs she may have. What makes SDWR so unique from other nonprofit service dog organizations is this highly customized and tailored training program. SDWR trainers will continue to return for training sessions with Zac and his family along with Alva for the next 18 months every 3-4 months to continue fine tuning Alva’s skills to best fit their lifestyle and Zac’s disability. What sets SDWR apart from other nonprofit service dog organizations, is that they have no age restrictions and none of the enrolled families ever travel in order to receive their service dog or participate in team training. SDWR’s customized training methods and careful considerations are made in order to match every service dog to their “person.” Zac’s service dog will work with the SDWR trainers over an 18-month training program towards public access training and certification. Through hard work and dedication of the organization and Zac they must work together to build on training foundations and fundamentals. Service Dogs by Warren Retrievers is a non-profit organization based in Madison, Virginia, and relies on donations to help the organization in its mission, “Until there’s a cure...there’s a dog.” To make a donation or learn more about SDWR, please visit the website, http://www.sdwr.org. To learn more about Seizure Response Service Dogs visit http://www.sdwr.org/service-dogs/seizure/. To find out how you can volunteer or serve as a service dog raiser visit http://www.sdwr.org/volunteer-opportunities.